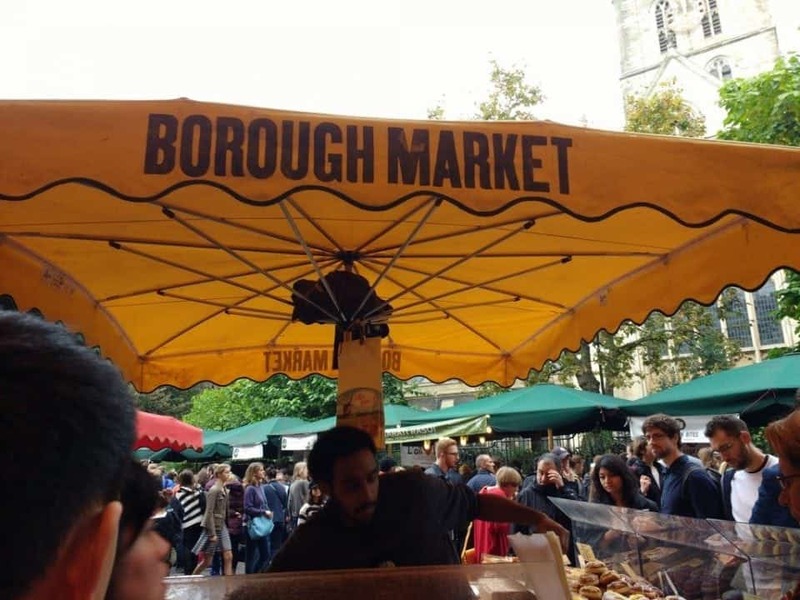 Borough market has been around in different forms for around 1,000 years. The best date historians can figure out is around 1014. It has always been at the south end of London Bridge, which was the only route across the river from the 990s until later centuries. Borough in Southwark has been home to the market for millennium due to its connections to both the north and south side of the City. A major artery for traders, military and folks coming to London it served as a respite for many and a place to hawks goods for others. 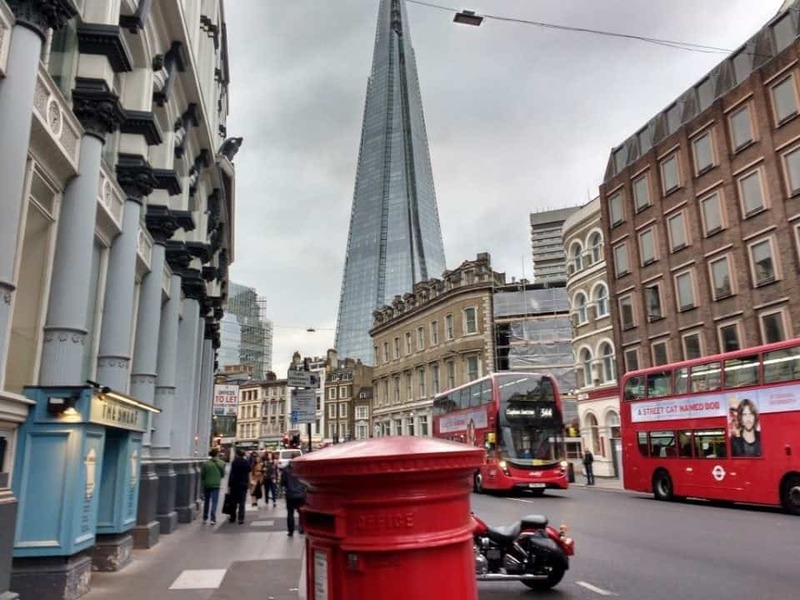 As London grew, however, the nature of the market meant that significant traffic and chaos grew around it and being in the middle of the road didn’t help. 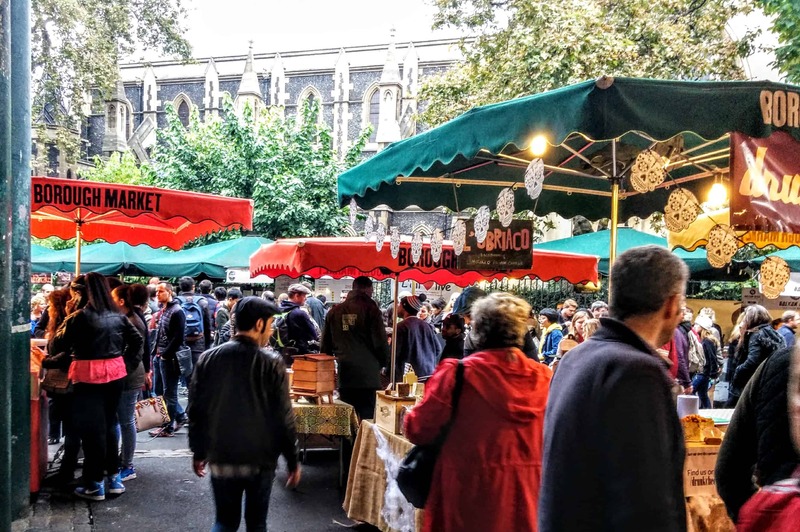 The protests against the market meant that a new market must be relocated and the land was acquired away from the main roads to build a new market. 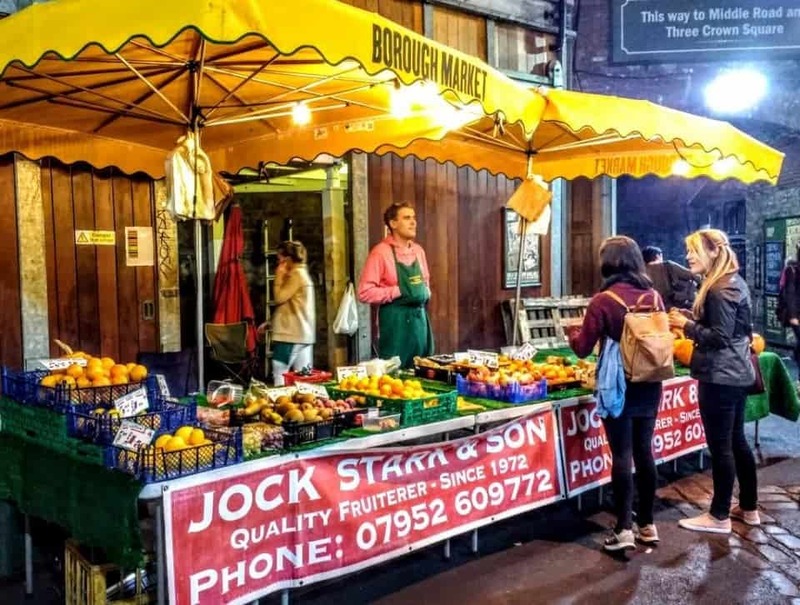 By 1757 the new and improved Borough Market was up and running. 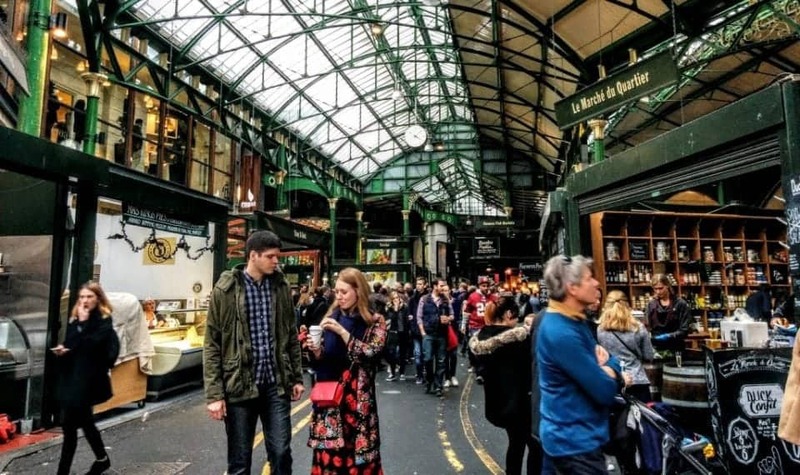 Borough Market today has its roots firmly planted in the revival of interest in artisanal foods that began in the 1990s. 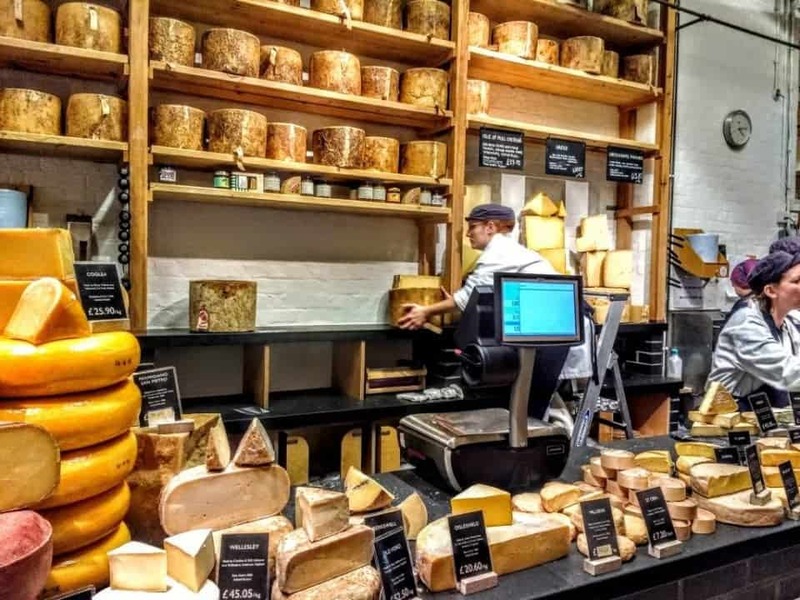 Some of the first pioneers at Borough Market were Neal’s Yard Dairy, which has to be absolutely the best cheese shop in London, and Brindisa, which specializes in Spanish foods. Borough Market today is packed with vendors and shoppers, drinkers and those who come here just to eat. 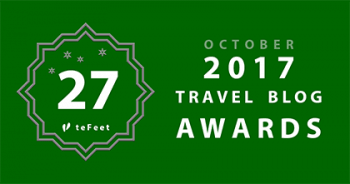 People spill over the sidewalks clutching their pints and snacking on all manner of delicious international and British foods. 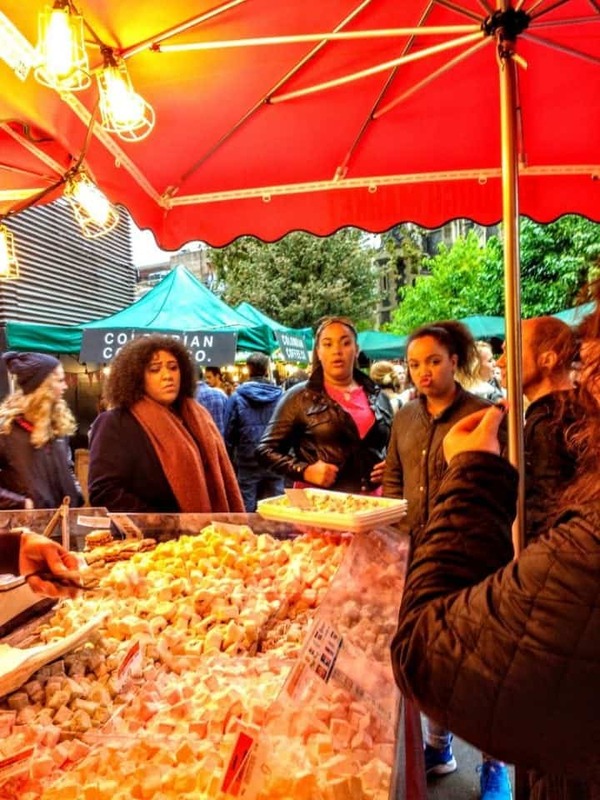 The stalls range from fishmongers to truffles and everything in between and every one offers samples to tempt you. 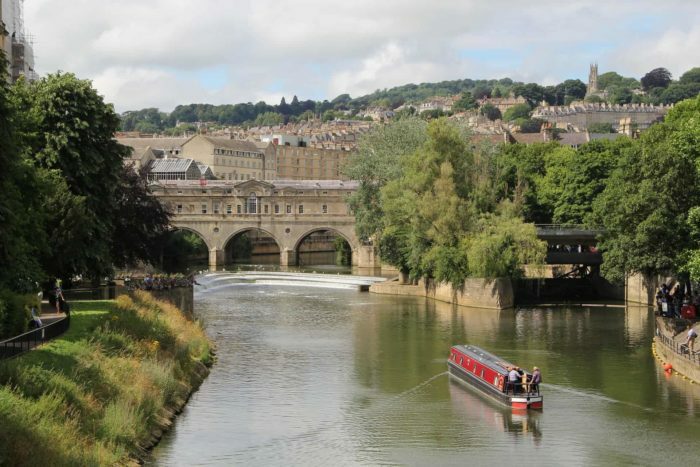 You can sit at the restaurants under the bridge and have a pitcher of Pimms or Sangria along with you chorizo on a bun or have a good old pint with your Scotch Egg. 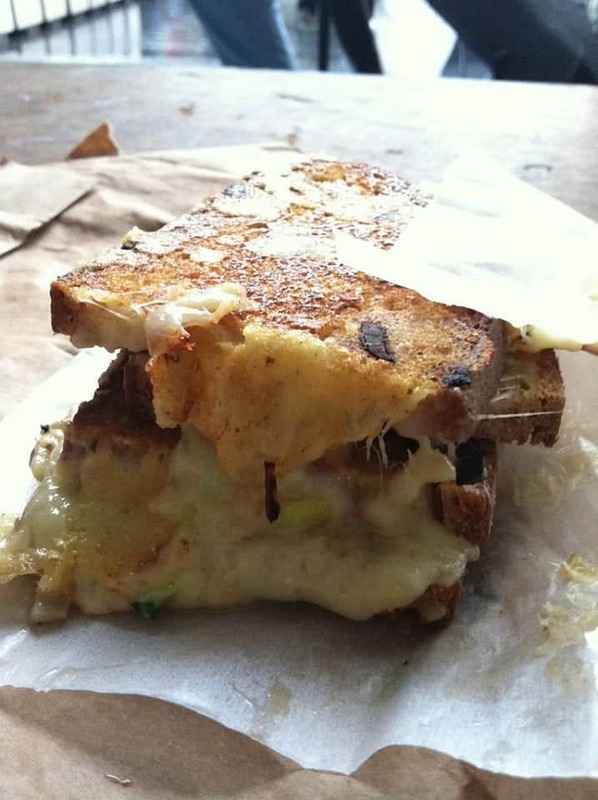 I think at any given time all the tourists in London’s head to Borough Market for lunch. There are so many places to eat near Borough Market, that it is always a battle to find what you want to eat and a space to eat it at. 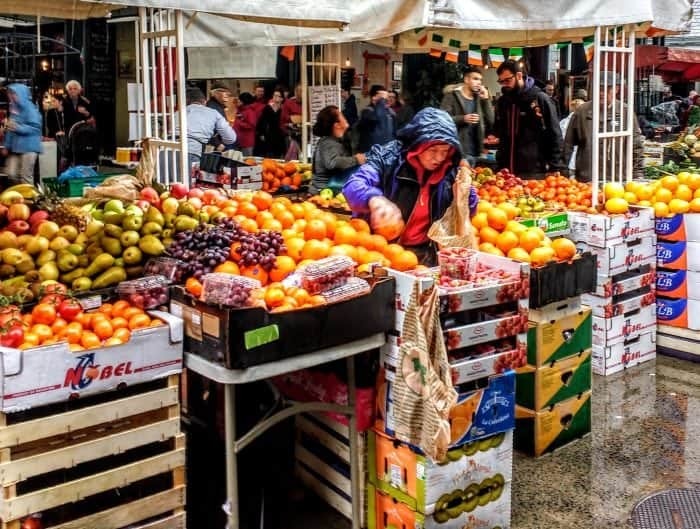 The market is open from Monday to Saturday from 10 am until 7 pm except on Saturday’s when it opens at 8 am. Monday and Tuesdays are limited market days so not all of the stalls are open. 1 Try to go during the week the crowds are less intense and you may actually get to try exactly what you want to eat instead of waiting in interminable line-ups. 2 Go with as many people as you can find – that way if you all order something different, you get to try a bit of everything. 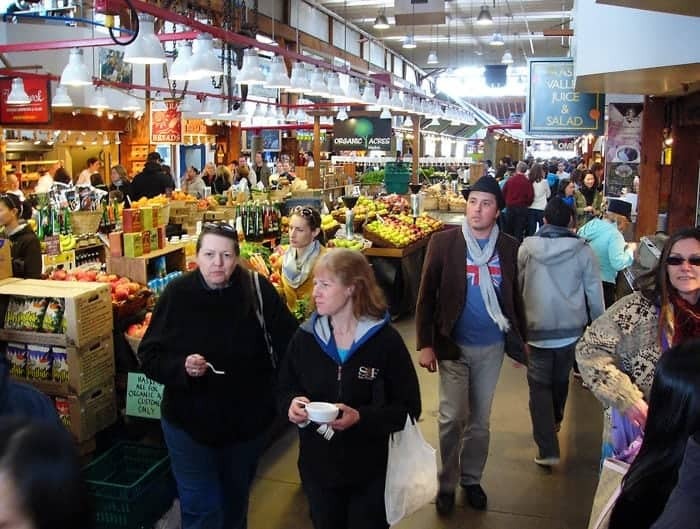 3 Make sure you check the Market’s schedule for shop openings and arrive as early as you can. That way you can figure out what you want to eat before the crowds descend. 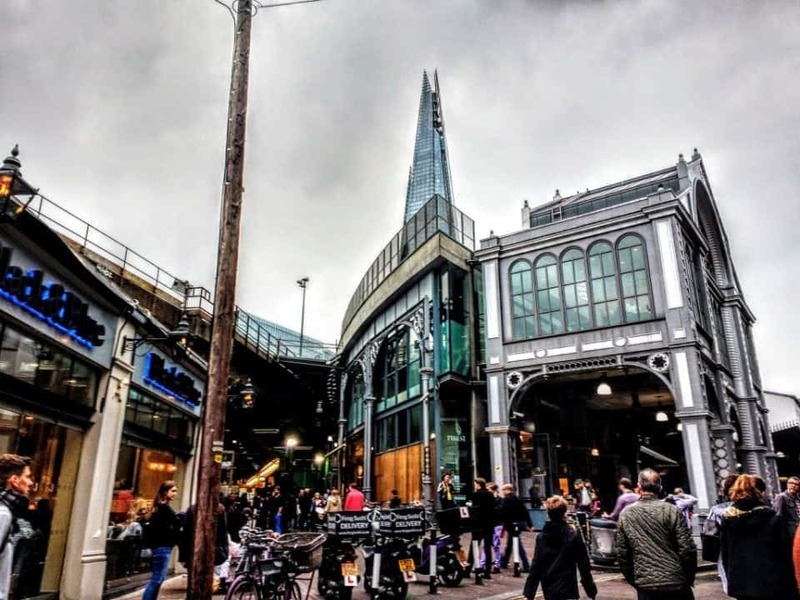 If you are planning to shop at Borough Market make sure you take some shopping bags with you to easily carry what you buy. 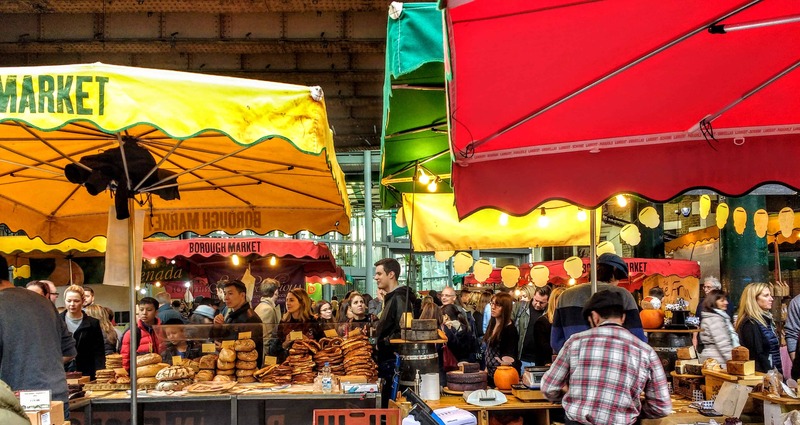 The majority of street food booths in Borough Market are arranged along the outside wall. There are around 10 or so stalls to choose your lunch from where you can grab a bite and a drink and hopefully a table to eat. You will also see a few other food stalls scattered throughout the market but this is the area, which has the most variety to choose from. Most of the dishes here are vegan and they describe their food as “Indian with a twist”. From the best chaat (a chickpea stew), I have ever tried to a beautiful dhal with mung beans and a rich warming spicy Kofta in a deeply flavoured tomato sauce. Horn OK Please is a slogan that is seen across the back end of vehicles in India. 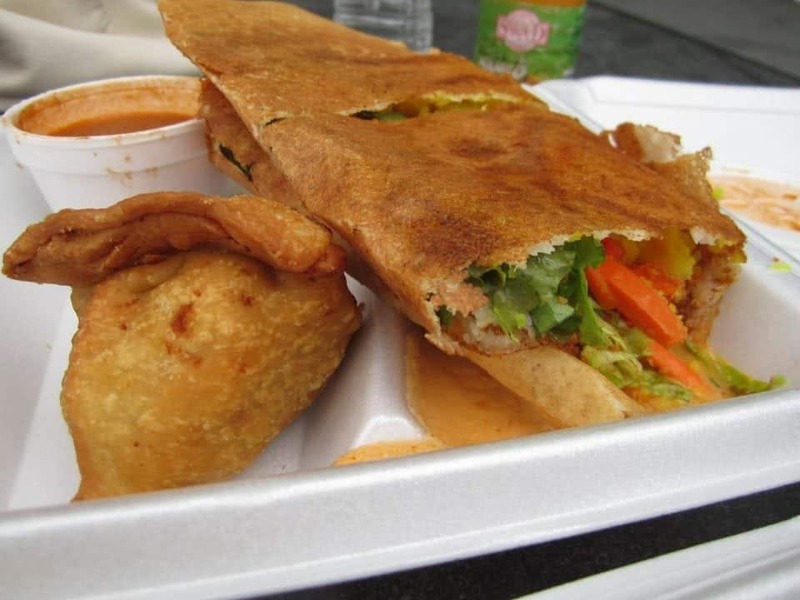 This stall wants to showcase the best of Indian vegetarian street food and serves dishes from all over the country. From moong dal dosa (a flat sort of pancake) aloo tikki chaat to Pani Puri these dishes are deeply flavoured and rich in Indian spices. The Big V is where you get your vegan fix for some of the tastiest seitan mushroom burgers, vegan hotdogs, garlic sausages, and vegan “bowls”. The line up extends forever and people rave about these burgers. This is another all vegan stall at Borough Market that serves this traditional Egyptian dish. I had Koshari in Egypt and this is much better. 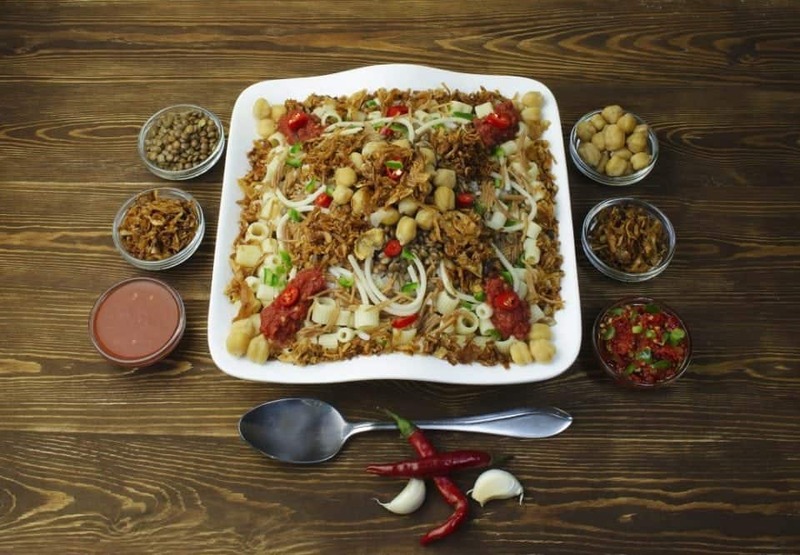 It’s a mix of rice, lentils, pasta with chickpeas and some tasty crunchy fried onions on top with a doqqa, which is like a crumbly mix on top. They have some great Egyptian salads, falafels and tons of other vegan options. 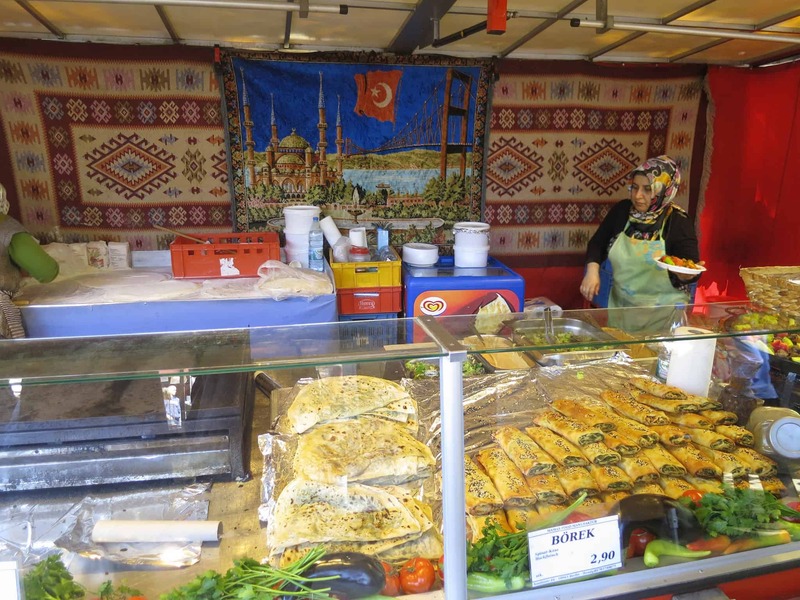 This is a middle-eastern restaurant that also has a stall on the outside of the market. They serve a fantastic selection of fresh meze and their hummus and Baba Ganoush is to die for. They have tabbouleh and some beautiful butterbeans in a tomato sauce. Don’t forget to try some of the falafels and filled vine leaves, oh and the roasted artichoke salad is heavenly. Artichoke salad, tabbouleh, butterbeans in tomato sauce are favourites) and a couple of ‘finger foods’ (like stuffed vine leaves and Beiruti falafels). Boureks’s are one of my favourite things in the world and I have had them in places from Turkey to Canada. 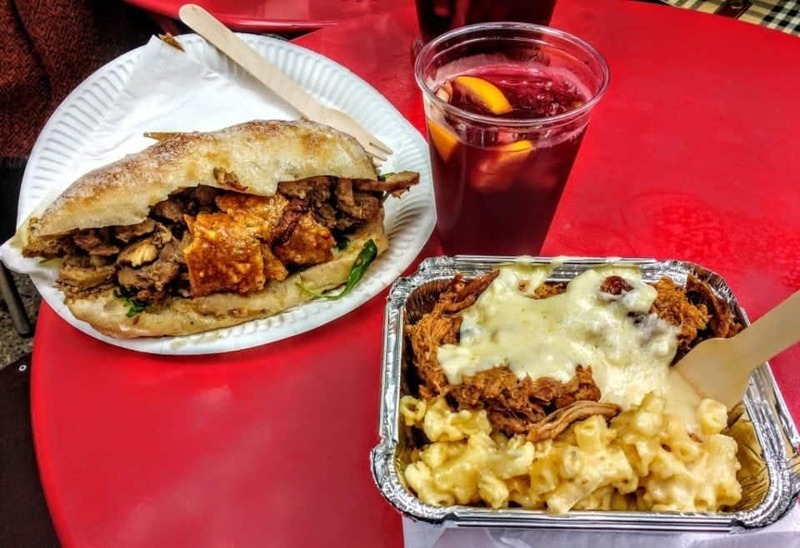 This is real street food a fantastic savoury or cheesy filling wrapped in a flaky tender pastry – perfect for munching and walking the market at the same time. If you love Turkish delight The Turkish Deli stall does a phenomenal range of interesting flavours. My nieces spent nearly an hour here attempting to decide on what flavours they wanted. You can also treat yourself to a cup of Turkish coffee whilst the kids are choosing. 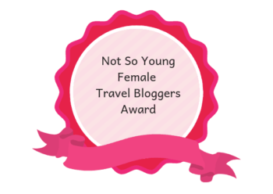 We foodies chase food all over the world and travel bloggers have many a tale to tell about their favourite street food. 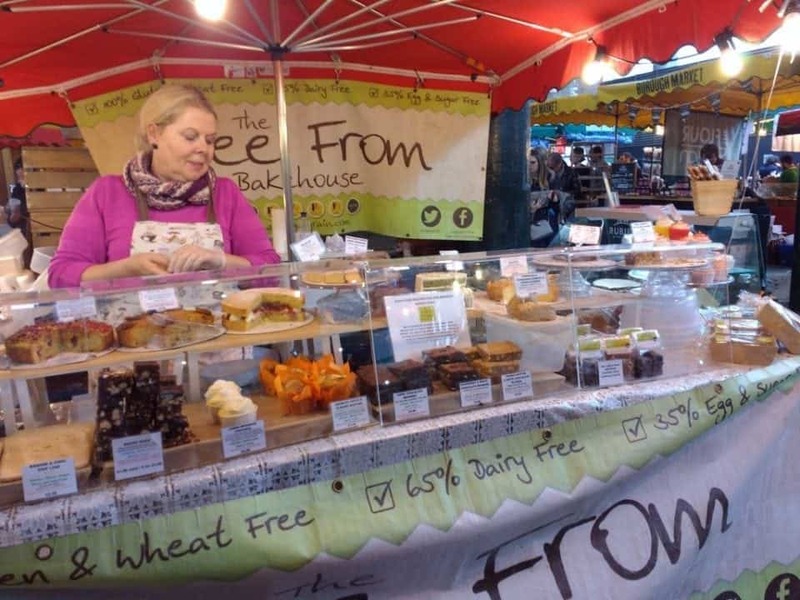 Free From Bakehouse also does a huge range of cupcakes, flapjacks, muffins, bread and cakes that are vegan, vegetarian, wheat-free, gluten-free, dairy-free, soy-free and more. Now not all the products are dairy or egg free but there is an ever-increasing list of vegan cakes, cookies and even brownies. Famous for its salt beef beigels and sandwiches – a beigel is a sort of soft Jewish roll that is boiled before it’s baked. Sounds a bit like a Montreal bagel, which is prepared the same way. 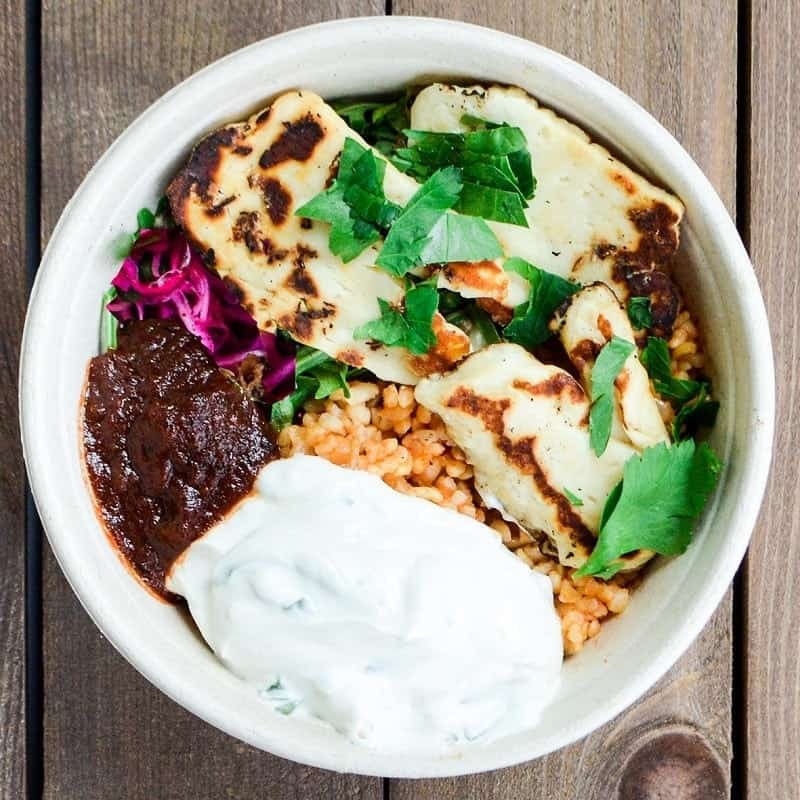 Nana Fanny’s also does a great range of vegan and vegetarian falafel bowls and wraps. Everyone stops to check out the pig on the spit at Roast Hogs. The smell fills the air and gets your taste buds going. God knows how many pigs these guys go through in a day at the Market but it must be hundreds of pounds. You get a huge serving of tender roast pork topped with arugula in a lovely fresh bun. This is a meat lover’s dream of a sandwich. At Kappacasein is a stall that you will always see a huge line up at. I mean really, who can resist beautiful potatoes smothered in cheese and piping hot Raclette cheese at that. Pickles come on the side if you want or perhaps you are in need of a grilled cheese fix? If so, this is the place to line up for it. England is obsessed with Spain I don’t think I met a person who had not taken a holiday in Spain somewhere and come back completely in love with Spanish food. The shop itself offers a huge range of products direct from Spain including Jamón Iberico, Manchego cheese, chorizo and so much more. One of the best sandwiches at Borough Market is the Brindisa Chorizo roll stuffed with rocket, roasted peppers and a tremendous Spanish made chorizo. 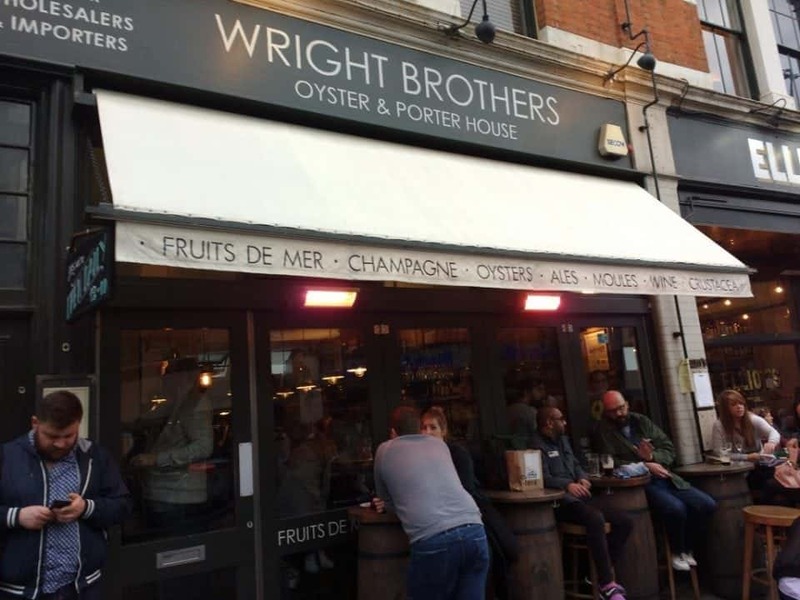 You can’t miss this restaurant, it’s not really street food per se but you can see huge crowds hanging around the outside stand up tables quaffing a pint of the black stuff with trays of fresh oysters on ice in front of them. Wright Brothers have their own oyster beds in the Southwest of England that they harvest these beautiful little morsels from. The best place I have found in London for some fantastic jam doughnuts or jelly as the Americans say. Soft, puffy coated with sugar and loaded with glorious homemade jam these are made for munching and walking. You can also take home some fabulous fresh bread for later. Any kind of roast you can think of is served at Hobbs. Turkey with stuffing and cranberry sauce, salt beef with dill pickles and some of the best pork loin with apple sauce and stuffing packed into a to die for a crusty roll. Hash is an institution at Borough Market they are found at the bottom of the stairs at the entry to the Market and there are tables scattered over the area, which you can rarely get a seat at. At Hash, you can have your mac and cheese fix served with pulled pork or have some delicious gumbo. Washed down with a beer or wine served from one of the other stalls along the entryway. 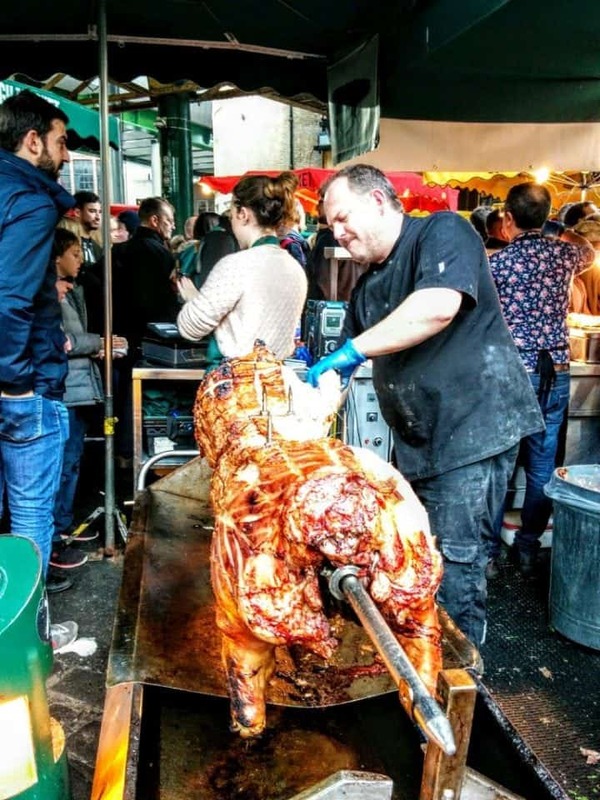 An Eastern Mediterranean street food stall that serves up ethically sourced British meats from kid goat rose veal to mutton. Gourmet Goat has beautiful soft fresh pitas filled with these kinds of meats, a great selection of kebabs, grilled halloumi and awesome salads. There are loads of actual sit down restaurants at Borough Market and some traditional British style cafes (kaffs as they are called here). I already mentioned the fabulous Chorizo roll from Brindisa but you can also take a seat inside and enjoy some of the best tapas in London. Already mentioned above but this is a sit-down restaurant where you can get some gleaming oysters and great fish and chips. 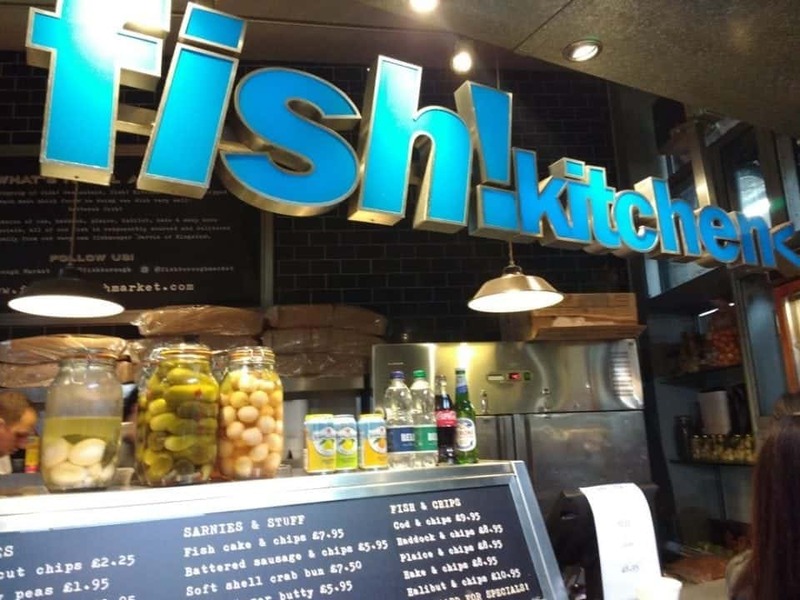 Is a glorious glass-encased restaurant and fish stall located in a Victorian pea-shelling warehouse. The restaurant sources all its seafood room the market itself and the fish and chips with mushy peas are sublime. Fancy a traditional English roast dinner loaded with beef, pork or lamb and enhanced with good veggies, superb gravy, roast potatoes and possibly a Yorkshire pudding? This is the place to go for a proper Sunday Roast served with all the trimmings. Cheap and cheerful doesn’t quite do Maria’s Market Café justice, although they are two words that describe it well. The traditional English café (pronounced “kaff”) is a Borough Market institution and has been here since 1961 providing bubble and squeak fried breakfasts, and bacon sandwiches to rich and poor alike. El Pastor is a Mexican taco bar that makes its own in house tortillas. I haven’t tasted such Mexican freshness since I lived in Mexico for a year. 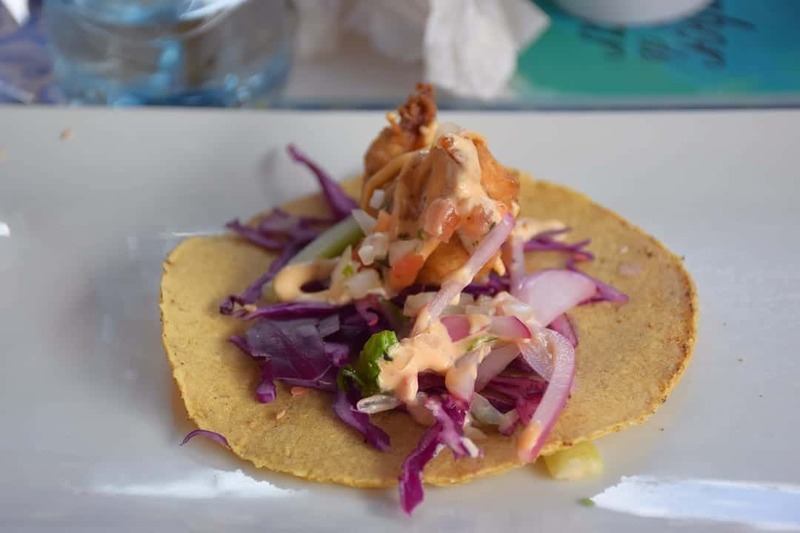 These tacos, salsas are perfect washed down with a great tequila or mezcal. People rave about the freshness of the in-house pasta here but complain loudly about the massive line-ups to get in. Putting that aside this is literally some of the best and most reasonably priced pasta in London. You will find all types from various regions of Italy and some of the most divine burratta you have ever tasted. Order a few dishes to share they are not huge in size but massive in flavour. I can’t say enough about Neal’s Yard Dairy one of the most famous cheese stores in London let alone Borough Market. Neal’s Yard is superb, you are greeted by wheels of cheese and the aromas are delicious. A cheesemonger wanders the shop and greets you with some of the most fascinating information about cheese. Then you can go and taste every conceivable cheese in the case. 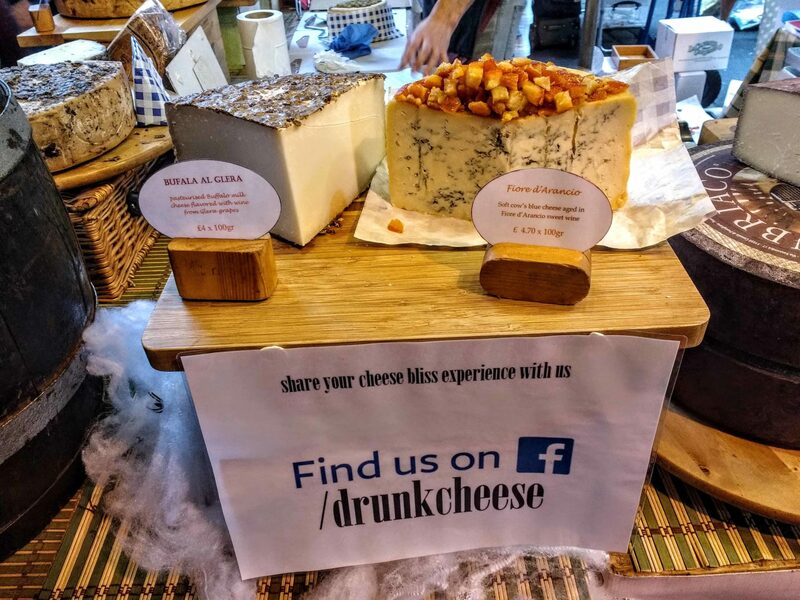 For cheese lovers, this is simply heaven. 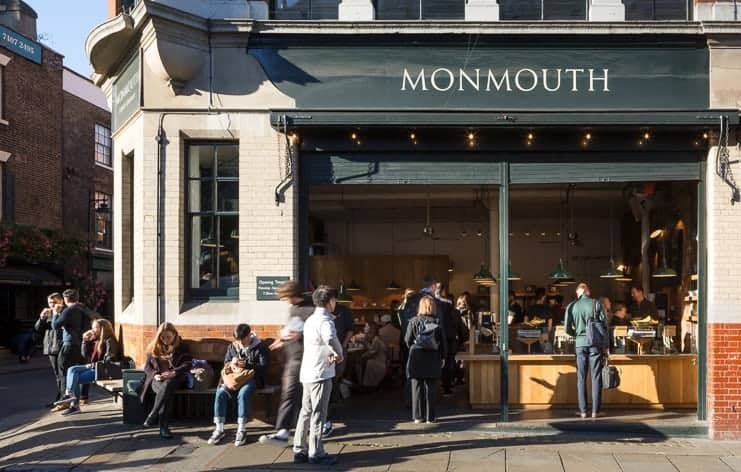 Monmouth Coffee has been around at Borough Market since 2007 but has existed since the late ’70s at Covent Garden Market. Serving up some of the finest coffee in town you can also take home some of their great grinds. Turnips, simply the best greengrocer in the heart of London is found in the literal heart of the market. See if you can find the superb bakery Bread Ahead in the north quarter and the celebrated butcher the Ginger Pig on the western side. 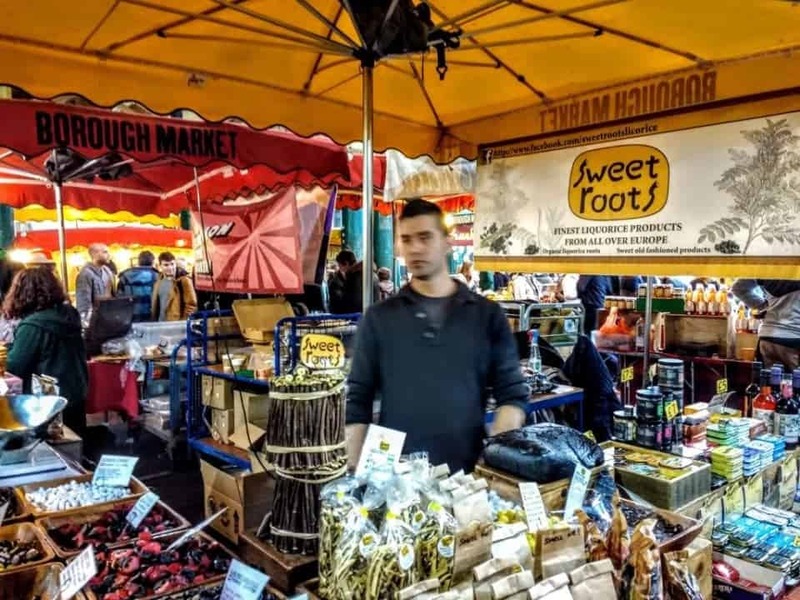 You can also find fancy mushroom stalls, gorgeous aromatic flower booths, fine art and household items, fresh fish and so much more. When the market closes and the night begins you can’t go wrong with dinner at Black and Blue, on the western side of the market, steps up to fill your great steak fantasies, with excellent wine pairings this is the place to begin your evening. 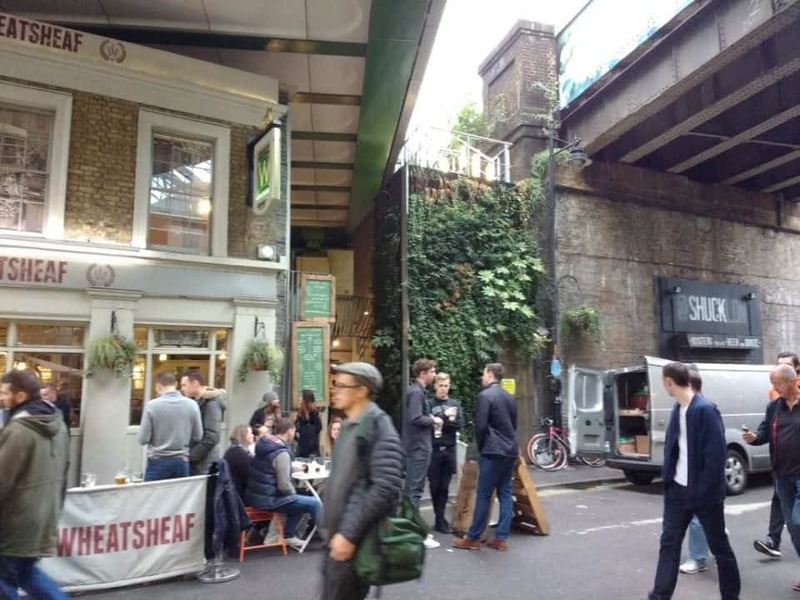 A few doors down is the Wheatsheaf, which has a really cool beer garden – and great pub grub. There is also The Globe which featured above it Bridget Jones’ flat in the movie. 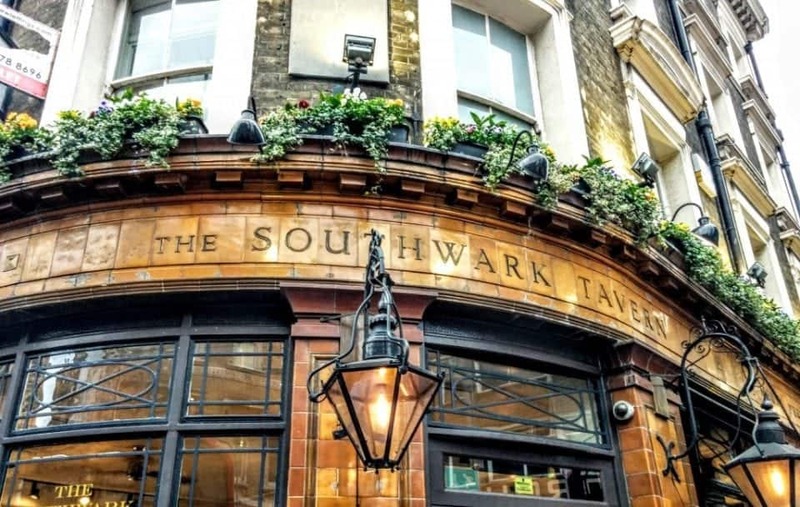 The Southwark Tavern is at the edge of the market has been around since the 1800’s. The tavern is housed in what used to be a debtors prison back in the day. Now the cells have been converted into snugs where you can enjoy a real British pint. The Rake pub is tiny almost Borough market secret. It doesn’t really serve food but it does have an absolutely stellar collection of craft beers from all over the world. The real treasure here though is Scotch Eggs – my absolute British favourite. A boiled egg cooked perfectly so the yolk sets but is still luxuriously creamy surrounded by a savoury minced pork coat then dipped in bread crumbs and deep fried – it doesn’t get any better than this. 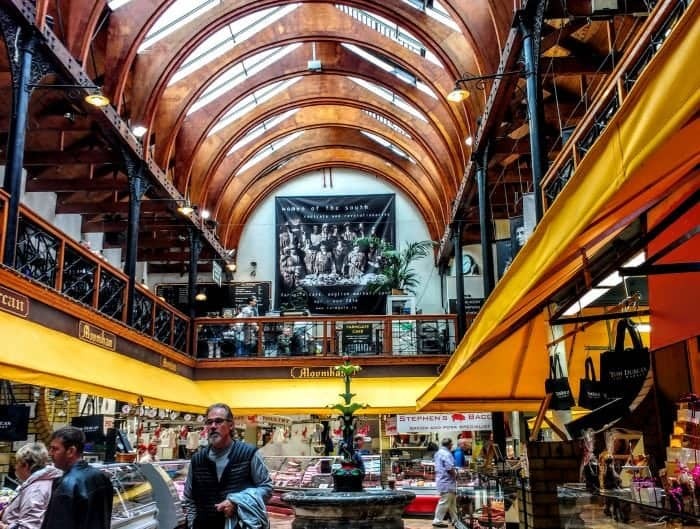 Laura at Savoured Journeys has a fantastic blog piece about what to eat at the market that you really shouldn’t miss. 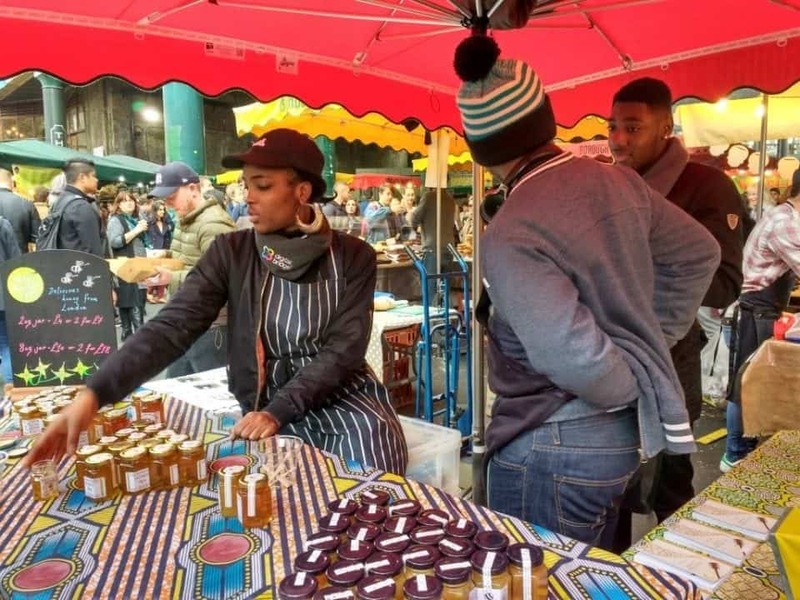 There are so many markets to choose from in London I can highly recommend getting to Brick Lane Market. If you love street art and want to check out some famous artists, take a look at these two posts by fellow bloggers. Street art paradise in London’s East End – Brick Lane is written by Aga who lives in Scotland and is a fanatic for great street art. Barbara is another traveller who has written about a really cool graffiti tour of London that teaches about the famous street artists whose work decorate Brick Lane The London Graffiti Tour of Shoreditch with Banksy, Ben Eine, Ronzo, this is a superb piece that details the work of art and who the artist was a must read if you are going to be in the area. 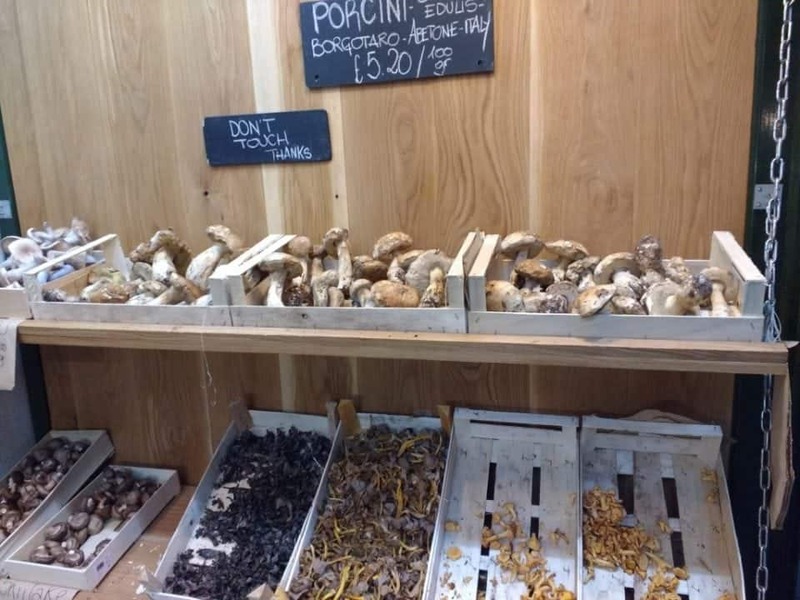 A visit to Borough Market should be on anyone’s bucket list when visiting London. It may be crowded but it is a deliciously obsessed foodie crowd savouring some of the best eats in London. 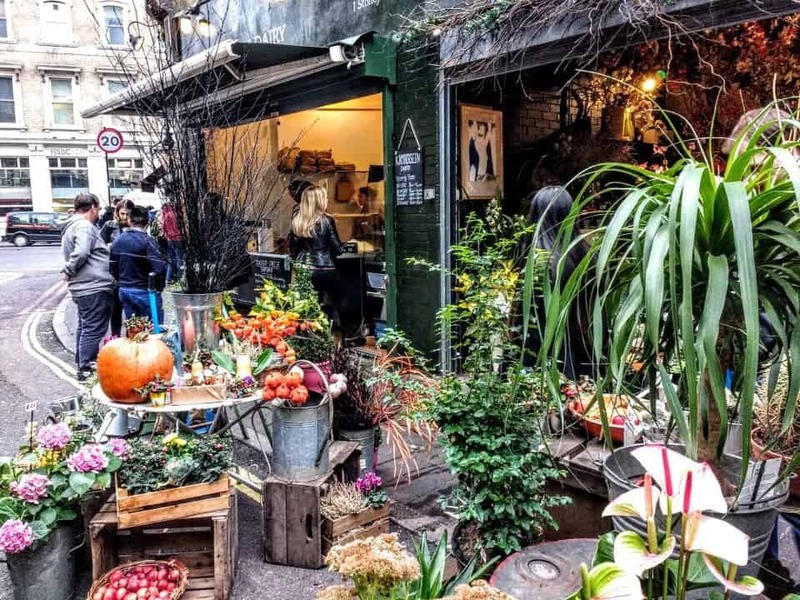 Have you been to Borough Market yet? IF you have what was your favourite thing to eat?